Successfully Added Ken Xin Da S7 GSM Smart Phone - Quad Band GSM, 1.54 Inch Touch Screen, Bluetooth, SMS, FM Radio, Heart Rate Monitor (Black) to your Shopping Cart. Why wear just a watch, when you can wear a smart watch that also doubles as phone? The Ken Xin Da S7 comes with quad band GSM network coverage, a built-in heart rate monitor, Bluetooth support and more! With the Ken Xin Da S7, you not only get a cool stylish touch screen smart watch. You also get a secondary phone that can sit right there on your wrist and make sure you never miss an important call or notification. A capacitive 1.54 inch touch screen will let you dial the needed numbers quickly and conveniently so you can make calls on the watch on the go, at the gym or any other situation when using your smartphone comes with a hassle. 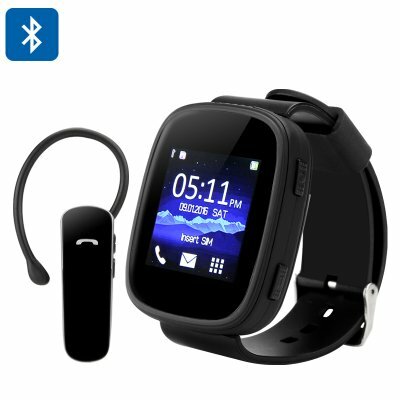 Hook up the GSM watch phone to your primary smartphone via Bluetooth and get extra features: SMS sync, music play and more. Stay up-to-date and never miss a notification! Use the built-in heart rate monitor during workouts, jogging or long walks to keep an eye on how your body responds to exercise and make efficient fitness progress. Coming in classic black color with a 1.54 inch touch screen, the watch is easy to navigate and sits comfortably on your wrist, held in place by a comfy adjustable strap. The smart watch has a 450Ah battery and is easily charged with a micro USB cable (included). The Ken Xin Da S7 GSM Smart watch comes with a 12 months warranty, brought to you by the leader in electronic devices as well as wholesale GSM cell phone watches..